Cheshire Academy is a middle school located in Cheshire, Conneticut. It is one of the oldest boarding schools dating back to 1794. Cheshire has a long history with many famous individuals have attended the school, including JP Morgan, Andrew Foote,Angela Robinson, Joseph Wheeler, Chester Bowels, among others are the list of alumni. Our consultant tour of Cheshire started with a student in the middle school who was born in the area, and a day student. We visited the entire campus walking through each department, and visiting classes where students attended in the upper and lower school, where there we learned, students attending Cheshier were proud, exctied, and very comitted to the community in itself, They were also familar with the history of Cheshire, and faculity and the commuity at large. This is a very community based boarding school, where everyone knows of the school, its students, and its reputation. The approximate student population is 360 with a mixed co educational student body. 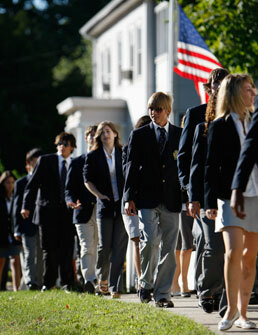 Cheshire has the presence of a lower and upper school on campus, with student of varied age groups from the 6th to the 12th grade. There are a vary of activities for students ranging from art to athletics, many students are day students, and others are boarding students offering flexiblity for parents. The consultants on our tour, were impressed by the faculty support of the school and we had a introduction by each of the faculty at an open luncheon for consultants. The head of schools, recently took the position from leaving Exeter Academy in Exeter, New Hampshire. I lived in Exeter and know the prestige of attending a school like Exeter, and Cheshire ranks very high in this number. Chershire has a friendly campus, not only with staff but students, it covers lower grades and moves to the upper grades. Cheshire does support students with special needs as well. The class size is larger than a small boarding school, but each student receives individual attention in most subjects. 60 (sixty percent) of the students are boarding students, the other are day students. Teacher ratio is 7 to 1. The endowment is 7 millions and the school does offer scholarships. Admission is in Feburary with a rolling admission policy. Chershire offers AP courses including history, Spanish,literature and composition, psychology, music theory,European History,Chemistry and Calculus. American Goverment, statistics, and other advanced classes. This would be the prefect school for a high achieving student, who is advanced in mathmatics, or had an interest in the arts. The school also has a strong fine arts department with classes in art , digital photography, theatre, and drawing and painting. There is also a good athletic program which includes: competitive swiming, soccer, volleyball, and other sports. All students eat in the dinning area, which is scheduled daily. Day students are often dropped off by parents, but transportation is avaialbe for on campus activities. There is a strong parent support group at Cheshire, with involvement year around and a summer program. The parent association is very active, involving faculty and students in fundraising. Activiites and funraising happen year around. Cheshire does have a uniform policy, but on our visit most studentss were dressed in either casual dress similar to uniforms or wearing uniforms. Schools in Conneticut have a long history of exceptional learning, and Cheshire is one of those schools, which have both the accceptance in the academic community, and community at large. Families receive a family handbook for students enrolled in the school, and tuition is $42, 000 dollars and day school just about $31,000 (thirty one thousand dollars. Acceptance in colleges is a given at Cheshire and most students do attend major universities here acceptance rates are very high or excelling. We found the school to be in a good range for prices at a middle boarding school. Additional cost for uniforms, books, and activities must be factored in the overall tuition. Cheshire has a long history of excellence. and a proven record of sucessful alumni. Most parents lviing in the New England area are familiar with Cheshire. Parents in the mid west or southwest would probbly considre this a far distance to travel. We believe its one of the better schools for families, and would recommend the school either in lower or upper grades. A excellent support with parent committes makes this a interacative campus of parents and students. Education is widely accepted as one of the most important decisions in the life of your child. The quality of schools you choose can affect their intellectual development providing the needed support which we address in school placement. These critical skills can be the first step in your child's educational trajectory, critical at Educational Planning and Counseling Services. and we are ready to help if you find your child struggling in first grade, a college senior, or anywhere in between, then our professional will similarly be ready to assist.